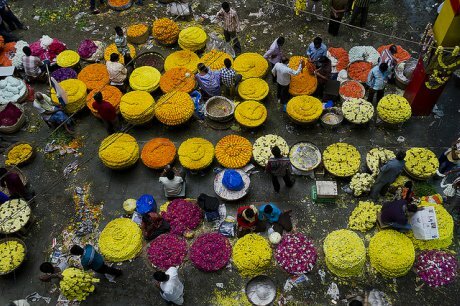 Flower sellers at Krishna Rajendra Market, Banglaore. Credit: Flickr/Rajagopalan Sarang. Krishna Rajendra market in Bangalore is a riot of noise and color, selling everything from fruit to flowers to hardware. It’s become a symbol of a thriving urban economy. In the basement-level flower market women outnumber men among the traders, but they mostly occupy spaces that are communal (like corridors or staircases), or illegal (like the pavements outside). Meanwhile the men, seated on elevated platforms, are officially recognized by the municipality as wholesale vendors. That’s important because it’s the wholesale trade that generates the biggest profits in the flower business and the most influence over the way the market works. In fact, only one woman sits up on a platform among the 486 wholesale flower vendors. Her name is Kavya, and she “was happy to be found out” in her own words. Kavya’s story unfolded over many interviews at bus stops and in market alleys and corners, whenever she could find a quiet moment to speak to me. At the outset I was expecting to hear the same story I’ve have heard many times before: one where a woman climbs up the ladder as a result of hard work, persistence and sacrifice, fighting the odds of a patriarchal structure deeply entrenched in the foundations of caste and class. But more than anything else, Kavya's life illustrates how intangible emotions and constructs like love, faith and forgiveness interact with and influence power relations in social and economic systems. Hers is a story that abounds in contradictions, highlighting the complexity of negotiations in which women are engaged. These complexities determine the battles they choose to fight, the manner in which they do so, and the circumstances under which they tolerate or accept inequality. Current frameworks for the study of gender and labour are yet to interrogate these complexities - bound as they are by geographies that aren’t just physical, but also imagined, inherited and possessed. Kavya was born and raised in Gauribidanur, a small town about 75 kilometers from Bangalore where the main cash crop is Kanakambara, a small orange flower that’s used for religious purposes or to wear in the hair. Married to Ramesh after a lengthy courtship, she came to the city to explore a new life when her husband realised the potential of sourcing flowers in the town and selling them in Krishna Rajendra market. Within a couple of years Ramesh found enormous success in terms of sales and profits. During this time, Kavya worked as many as three jobs a day to make ends meet and ensure that her daughters attended English-medium schools. Eventually, her husband returned, but bankrupt. A month or so of silence ensued between them, before Ramesh tried to convince his lover to come back to him. When she refused, he’s believed to have murdered her in broad daylight in front of a hundred witnesses. He was arrested soon after. “He wrote to me fifteen days after he was in jail,” Kayva told me, “and apologised for spoiling our marriage and the lives of our children. He asked me to help him get out of jail so that we could build our life again together. The fact that he apologised was enough for me, and I spent whatever little savings I had on lawyers and all my time in convincing the witnesses to change their statements.” Ramesh was released from jail four years later. Kavya’s story contradicts the claims made by the Flower Association President and many others about the kinds of work that women can and cannot do. She carries loads, uses the weighing scale, shouts out loud, is able to price sensibly and earn decent profits, has the business acumen to interact with other traders, travels and negotiates deals, and is able to deal with multiple levels of conflict successfully. While in one sense she has challenged, provoked and changed the patriarchal nature of the wholesale trade, her empowerment in the market has not translated into changes in her own, domestic world; nor has it triggered debate or wider action among women in the market. In many discussions with me, she opined that it was women themselves who were their biggest obstacle because of their lack of ambition and willingness to take more risks. Feminists could argue that much of her behaviour is rooted in deeply socialised gender norms. If marriage is a matter of equal give and take, of mutual consent and choice, then—at least from the outside—it appears that she has given far more than she has received. However Kavya's sheer tenacity, her courage in holding her own in male dominated spaces and professions, and the moral authority she’s gained in her relationship with her husband and her peers in the market, illustrate that processes of transformation and empowerment are never linear. Although these aspects of her story may not appear to fit into a feminist political frame, working women are always engaged in negotiations around the politics of labour and gender in everyday life. This consciousness is connected not only to knowledge, power and money, but also to faith, love and longing. Unless the questions we ask encompass the full spectrum of these emotions and experiences, we’re unlikely to find the answers we are looking for, or to understand them in any depth.